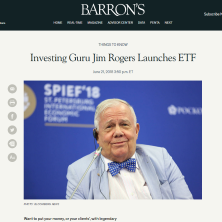 Want to put your money, or your clients’, with legendary investor Jim Rogers? It just became easier, now that Rogers is launching an ETF. The fund, called the Rogers AI Global Macro ETF (BIKR), will rely on an index that Rogers, 75, and his colleagues at Ocean Capital Advisors created using artificial intelligence to analyze global economic data, CNBC reports.